This manual is a resource for teachers seeking specific information about bluegrass music to present to a class and for bands/musicians interested in developing school programs. Included in this publication you will find specific program information about bluegrass music and a suggested presentation outline, along with funding development ideas and a list of written, DVD and internet program resources. Play a traditional bluegrass song after being introduced. Talk about the roots of the music and influences by music from other countries (include discussion of the ballads and dance music from the British Isles that influenced string band music of Appalachia, the banjo from Africa, the singing family bands of this country, gospel music, etc.). Play another traditional tune or sing a song. Introduce Bill Monroe, who included string band, country, gospel and blues stylings in the development of bluegrass music. Mention that he was inducted into the Rock & Roll Hall of Fame–in addition to the Country Music Hall of Fame and Bluegrass Hall of Honor, and perform a Bill Monroe song. Introduce each instrument by discussing how it is made, tuned and played in the bluegrass band context. Discuss rhythm and lead playing and play a tune. Discuss and demonstrate harmony singing and sing a song. Involve the students in performance of a song–hand clapping, singing on chorus, call/response, etc. Answer questions. Provide teachers with written information about bluegrass bands, clubs and organizations based in the local area; festivals in close proximity; bluegrass publications; bluegrass radio programming; the Foundation for Bluegrass Music; etc. A sample overview of the history of bluegrass music follows. It should be brief but comprehensive, as it may also be the introduction of the music to the teachers. The overview may be used by teachers as a study guide before or after an in-school presentation, or they may include this information in a history or social studies discussion if a program presentation is not possible. The various types of music brought with the people who began migrating to America in the early 1600s are considered to be the roots of bluegrass music—including dance music and ballads from Ireland, Scotland and England, as well as African American gospel music and blues. (In fact, slaves from Africa brought the design idea for the banjo–an instrument now integral to the bluegrass sound.) As the early Jamestown settlers began to spread out into the Carolinas, Tennessee, Kentucky and the Virginias, they composed new songs about day-to-day life experiences in the new land. Since most of these people lived in rural areas, the songs reflected life on the farm or in the hills and this type of music was called “mountain music” or “country music.” The invention of the phonograph and the onset of the radio in the early 1900s brought this old-time music out of the rural Southern mountains to people all over the United States. The Monroe Brothers were one of the most popular duet teams of the 1920s and into the 1930s. Charlie played the guitar, Bill played the mandolin and they sang duets in harmony. When the brothers split up as a team in 1938, both went on to form their own bands. Since Bill was a native of Kentucky, the Bluegrass State, he decided to call his band “Bill Monroe and the Blue Grass Boys,” and this band sound birthed a new form of country music. “Bill Monroe and the Blue Grass Boys” first appeared on the Grand Ole Opry in 1939 and soon became one of the most popular touring bands out of Nashville’s WSM studios. Bill’s new band was different from other traditional country music bands of the time because of its hard driving and powerful sound, utilizing traditional acoustic instruments and featuring highly distinctive vocal harmonies. This music incorporated songs and rhythms from string band, gospel (black and white), work songs and “shouts” of black laborers, country and blues music repertoires. Vocal selections included duet, trio and quartet harmony singing in addition to Bill’s powerful “high lonesome” solo lead singing. After experimenting with various instrumental combinations, Bill settled on mandolin, banjo, fiddle, guitar and bass as the format for his band. The guitar originally came from Spain. The mandolin, as well as the fiddle and acoustic bass (both from the violin family), originally came from Italy. While many fans of bluegrass music date the genre back to 1939, when Monroe formed his first Blue Grass Boys band, most believe that the classic bluegrass sound jelled in 1945, shortly after Earl Scruggs, a 21 year old banjo player from North Carolina, joined the band. Scruggs played an innovative three-finger picking style on the banjo that energized enthusiastic audiences, and has since come to be called simply, “Scruggs style” banjo. Equally influential in the classic 1945 line-up of the Blue Grass Boys were Lester Flatt, from Sparta, Tenn. on guitar and lead vocals against Monroe’s tenor; Chubby Wise, from Florida, on fiddle; and Howard Watts, also known by his comedian name, “Cedric Rainwater,” on acoustic bass. When first Earl Scruggs, and then Lester Flatt left Monroe’s band and eventually formed their own group, The Foggy Mountain Boys, they decided to include the resophonic guitar, or Dobro into their band format. The Dobro is often included in bluegrass band formats today as a result. Burkett H. “Uncle Josh” Graves, from Tellico Plains, Tenn., heard Scruggs’ three-finger style of picking in 1949 and adapted it to the then, almost obscure slide bar instrument. With Flatt & Scruggs from 1955-1969, Graves introduced his widely emulated, driving, bluesy style on the Dobro. The Dobro was invented in the United States by the Dopyera Brothers, immigrant musicians/inventors originally from the Slovak Republic. The brand name, “Dobro,” comes from DOpyera BROthers. From 1948-1969, Flatt & Scruggs were a major force in introducing bluegrass music to America through national television, at major universities and coliseums, and at schoolhouse appearances in numerous towns. 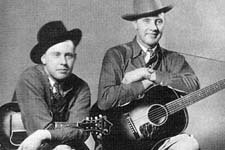 Scruggs wrote and recorded one of bluegrass music’s most famous instrumentals, “Foggy Mountain Breakdown,” which was used in the soundtrack for the film, Bonnie & Clyde. In 1969 he established an innovative solo career with his three sons as “The Earl Scruggs Revue.” Scruggs still records and performs selected dates in groups that usually include his sons, Randy on guitar and Gary on bass. After parting with Scruggs in 1969, Lester Flatt continued successfully with his own group, “The Nashville Grass,” performing steadily until shortly before his death in 1979. By the 1950s, people began referring to this style of music as “bluegrass music.” Bluegrass bands began forming all over the country and Bill Monroe became the acknowledged “Father of Bluegrass Music. In the 1960s, the concept of the “bluegrass festival” was first introuced, featuring bands that had seemed to be in competition with each other for a relatively limited audience on the same bill at weekend festivals across the country. Carlton Haney, from Reidsville, N.C., is credited with envisioning and producing the first weekend-long bluegrass music festival, held at Fincastle, Va. in 1965. The increased availability of traditional music recordings, nationwide indoor and outdoor bluegrass festivals and movie, television and commercial soundtracks featuring bluegrass music have aided in bringing this music out of modern day obscurity. Lester Flatt and Earl Scruggs & the Foggy Mountain Boys achieved national prominence with tour sponsorship by Martha White Flour and for playing the soundtrack for the previously mentioned film, Bonnie and Clyde, as well as on a television show called The Beverly Hillbillies. The Deliverance movie soundtrack also featured bluegrass music-in particular, “Dueling Banjos,” performed by Eric Weissberg on banjo and Steve Mandel on guitar. In 2001, the triple platinum selling soundtrack for the Coen Brothers movie, O Brother, Where Art Thou? attracted wider audiences for bluegrass and traditional country music. Bill Monroe passed away on September 9, 1996, four days before his 85th birthday. In May 1997, Bill Monroe was inducted into the Rock and Roll Hall of Fame because of the profound influence of his music on the popular music of this country. He is also a member of the Country Music Hall of Fame and the Bluegrass Music Hall of Honor. Bluegrass music is now performed and enjoyed around the world. The IBMA alone claims members in all 50 states and 30 countries. In addition to the to the classic style born in 1945 that is still performed widely, bluegrass bands today reflect influences from a variety of sources including traditional and fusion jazz, contemporary country music, Celtic music, rock & roll (“newgrass” or progressive bluegrass), old–time music and Southern gospel music–in addition to lyrics translated to various languages. There are several avenues that can lead to funding for in school programs. Federal monies are most often channeled through state programs, and state funding is often accessible through state and local arts councils and organizations. Local private funding sources include clubs, organizations and businesses that make contributions to various causes and sponsor programs that benefit the community. The schools themselves sometimes have program monies in the budget or through PTA or PTO organizations. All of these sources for financial support should be investigated once your program is formulated. Educators and performers often forget the value of an involved community and overlook the local area when seeking funding for an educational program. The school system itself may prove to be a good funding source. Music departments are sometimes allocated a separate budget, and music teachers are usually looking for new ways to present different forms of music to their students. When billed as “American Roots Music,” an educational program on bluegrass is sometimes easier to sell. If approached early in the school year (or in the spring for the following school year), teachers may be willing to earmark funds for a bluegrass program scheduled for the following term. School administrators may also have funds for outside programs, and it is always helpful if they are approached about a bluegrass program by a teacher who is familiar with the music. The principal may be interested in presenting your program or may direct you to the teacher or PTA representative who schedules programs. If you experience difficulty in reaching the school principal or music teacher (their schedules are usually very full), ask the school office administrator for a contact person in the PTA. Oftentimes the PTA schedules these outside programs and pays all or part of the fee from their own monies. In some areas, many parent/teacher organizations work together to find good in school programs and some even join together in larger “umbrella” organizations to sponsor showcases for artists who work in the schools. They also appreciate any opportunity to work together by booking an artist (or band) for several programs in the same geographical area over a one or two-day time period for a slightly reduced per program fee. This joint effort is called “block booking,” and all schools involved as well as the artist benefit from the plan. Ask a local PTA representative about any showcase events in your area and about block booking possibilities. If you find a school interested in your program but lacking the necessary funding, encourage their representative to contact other schools in the area to create a block booking opportunity. Offer a reduced fee to the two or three schools in close proximity (so your travel distance between schools is minimal) and ask them to work out the scheduling for two or three programs in the same day. Smaller schools with tighter budgets may opt to reduce their cost by busing students from one school to another for one presentation to the combined student bodies. Larger schools may feel that the student body is too large for one program and that two programs would be too costly. In this case, offering a reduced fee for the second program in the same school might encourage the school to schedule the programs. It is up to you to determine the maximum number of students that should attend each program presentation. Local civic and community organizations often fund events that benefit the community, and school programs that include educational value can attract this support. Clubs to contact include Kiwanis, Optimist, Ruritan, Lions, Civitan and many others listed on the sign of active clubs that is usually found on the outskirts of every community. Phone any organization to determine if they work with schools or are interested in doing so. If they express an interest in this prospect, request permission to make a brief presentation of your program overview at their next meeting. Local businesses are other possible funding sources, and the school administrators and teachers you have contacted may have information about business support they have received in the past or businesses that seem “school friendly.” Some of these businesses may have already reached the limit of what they can afford to give for the year, but many may be very open to finding a new way to offer their support to the schools. Local music stores that sell instruments and offer music lessons might be very interested in at least partially subsidizing an in-school musical presentation that could ultimately bring more students into their stores. The primary advantage of finding local funding for a school program is that it usually does not require the sometimes extensive paperwork and long waiting periods for approval that is often part of the government funding process. The difficulty with private sector funding is determining how to identify and approach possible funding sources. Nearly every state has an arts council organization with monies designated for arts activities. National Endowment for the Arts (NEA) money is usually channeled through these state agencies. Larger cities may have their own local arts councils or arts affiliated organizations. There are also many regional arts consortiums with memberships comprised of several state and local arts organizations. State arts councils usually offer funding to arts presenters through various council programs. Examples are “Artists on Tour” or “Arts in Education” residency programs that offer financial support to non-profit organizations in the state. Schools, churches and most community organizations are non-profit entities and can qualify for this type of funding. In some states, artists must submit examples of their work with completed application forms for review by a panel that selects a pre-determined number of applicants for inclusion on a roster for each of the various arts programs. For example, artists in the fields of dance, music, theater and visual arts can apply for inclusion on many state touring arts program rosters. Artists selected from each field are included in a program booklet that offers a one-page overview of their program with photo, fees, availability and contact person information. The arts council mails these booklets to arts council and theater presenters throughout the state, and any non-profit presenter organization can contact the state arts council to request a free copy of the booklet. Presenters who contract for engagements by any roster artist can apply to the state arts council for a subsidy of up to 25% of the artist fee through this touring arts program. These programs always have annual dates for submission of grant requests by presenters for the fiscal year, and a finite amount of available program money usually granted on a “first come, first served” basis. There are also deadline dates for artists to apply for inclusion on the roster, and the roster is usually revised annually or bi-annually. Contact your state arts council to request information about these touring or residency programs. Many states do not have the rosters described above and non-profit presenters can apply for funding from the arts council to present any artists who reside in the state. In either case, the possibility of receiving a small grant to cover part of your fee can be quite attractive to schools interested in presenting your program. Providing information about state arts council programs, including grant application forms and deadlines, may entice a school administrator to make the decision to sponsor your in school program. Regional arts consortiums usually include four or five neighboring state arts councils that have decided to work together to promote the arts in their geographical area. Contact your state arts council for information about any consortium in your region or directly contact any of the consortiums listed in the appendix of this manual. The consortiums offer similar types of arts subsidy programs, touring rosters and showcase opportunities at annual conventions. You may also have county or city arts councils in your area. The quality of your program materials will be a key factor in creating interest in your program by schools and funding sources. A general program overview that provides information about the presentation and band members and a study guide for teachers who might want to prepare students for your presentation will greatly enhance your possibilities of securing school bookings and support funding. Schools or organizations who are planning an educational bluegrass music presentation for students may apply for the IBMA Foundation Bluegrass in the School Matching Mini-Grant, in the amount of matching funds up to $200. Contact Eddie@IBMA.org for info, or click here to fill out a Mini-Grant Application form. The IBMA Foundation Matching Mini-Grants are funded in part by the D’Addario Foundation. Gather at the River: A Bluegrass Celebration, directed by Robert Mugge, filmed at IBMA Bluegrass Fan Fest 1994 in Owensboro, Ky.
3rd and 5th Monday's of the month in Hamburg NY near Buffalo. Organizes & supports educational bluegrass presentations at local schools, lending library of instructional DVDs & books, free first lesson on bluegrass instrument at local music store & discount follow-up lessons. CBMS also sponsors a bluegrass program for students at the Paradox Valley School, led by Ruth Phippeny and begun in 2003. 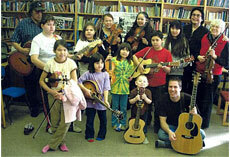 At an after-school program on Tuesdays and Thursdays, any student in grade 3-8 is given the opportunity to learn to play traditional bluegrass instruments. Hosts teacher workshop, children’s activities at festival, bluegrass camp the week before the festival, Bob Cornett has a strong interest in national educational reform, and he has written books on the subjects of bluegrass music and chestnut tree planting projects as ways to connect students with the real world and older generations. Duo on Iowa Arts Council’s Roster of Teaching Artists, offers school programs on various topics including “Little House on the Prairie,” “Sing & Play Bluegrass Music,” “Careers in the Music Business,” “Songwriting from Your Life” and more. Sponsored by the Minnesota Bluegrass & Old-Time Music Association, held end of Feb./beginning of March during the Wintern Bleugrass Weekend at the Radisson Hotel & Conference CEnter in Plymouth, Minn., for musicians age 8-18.